Uses: Education, Preschool Colors: Gray/White Lengths: 13 panel 24'-1" Heights: 4'-0"
Sara C. Henderson, Ministry Assistant at the Johnson Ferry Baptist Church Wee School (that is the cutest name ever!) sent us one of their preschool safety ideas, and we think it’s brilliant! 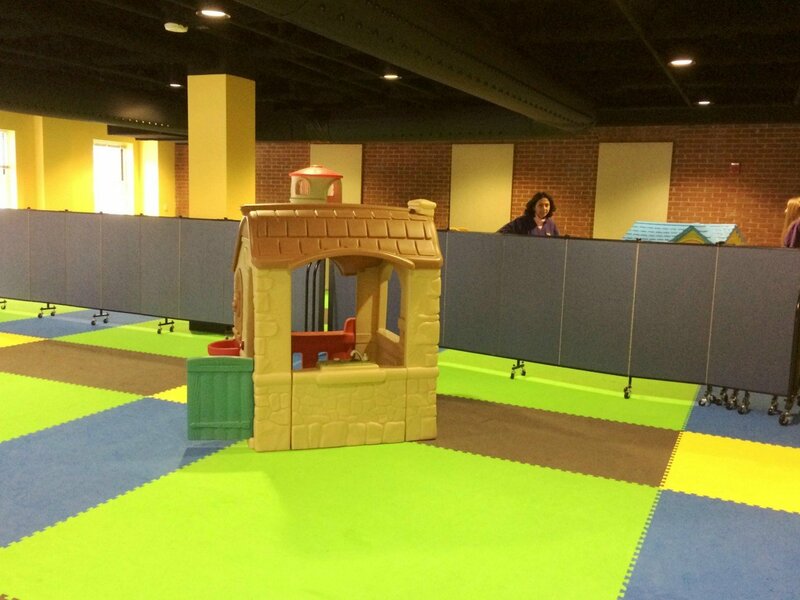 Because they arrive fully assembled and can be easily set up by one person, dividing play areas by age is a snap. Everything went well with getting the divider and the weekday teachers are using it every day to separate the two sides of the playground for younger and older preschoolers. This just helps keep the little ones safer. We actually use two to go the complete distance across the playground room. When they’re not being used to ensure a safe environment in the indoor playground area, these dividers are used for many other applications in the facility. The help corral crowds at registration night and also, because they’re tackable, as a way to display information to parents.